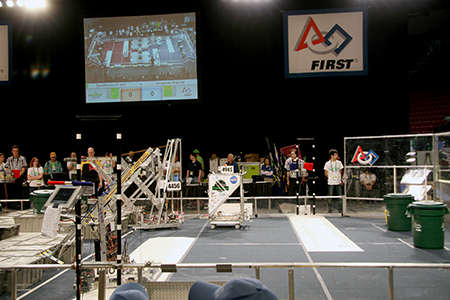 For the second year in a row, the University of Maryland hosted the 2015 Chesapeake Regional FIRST Robotics Competition at the XFINITY Center, April 2-4. More than 1,000 high school students from Maryland, around the United States, and from three other countries went head to head to secure a spot in the international competition. Each January, FIRST, a non-profit organization aimed at inspiring young people to be science and technology leaders, kicks off the competition season by announcing a new game to be played at 56 regional competitions around the world. Teams receive a kit of common parts that are used to build the core systems of a robot. Students work with hundreds of components, including programmable radio controllers, motors, electrical circuitry and mechanical parts, to build and program their robot for the competition. The teams have six weeks to conceptualize, design, and build a robot before entering a regional competition.Winners from each of the regional competitions will go on to compete at the FIRST Championship in St. Louis, Mo., at the end of April. This year's game, Recycle Rush, involves alliances of three teams each who compete to stack as many totes and cap them with recycling containers as possible within a two and a half minute match. Points are earned based on the height of stacks capped by recycling containers and teamwork between robots. A. James Clark School of Engineering Dean Darryll Pines delivered remarks and helped kick off the competition events on April 3. Participating Chesapeake Regional FRC students had the opportunity to learn more about the University of Maryland and the engineering programs available through the Technology Lounge at the event.